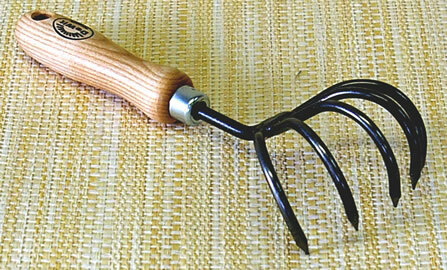 This English Dibber is 9 1/2" long with graduated lines for planting small bulbs, creating furrows for sowing seed and for transplanting. It is made from English oak. Two things always show up on British gardening shows...trugs and dibbers. 3 x Popular Tip Bag by Bosmere 23"x18"
9 x Bos Bag 20"X20"
5 x Lawn Claws Leaf Scooper 15"x12"
8 x Bamboo Pot Scraper 2"x2"
3 x Bamboo Spork 3"
6 x Blossom Flower Arranger Doily 8"
6 x Blosssom Flower Arranger 6"
7 x Copper Plant Labels by Bosmere 10"
7 x Burgon and Ball Weeding Finger 11 1/2"
8 x Sophie Conran Dibber 9 1/2"
5 x Handy Scoop Purple 11"
6 x Wellington Boots (soap) Scotland 4"
5 x Clarington Forge/Bulldog Household Shovel 17"
3 x Terracotta Bird Pot Feet UK 2 1/2"
8 x Clarington Forge/Bulldog "Fred's Onion Hoe" 16"
3 x Terracotta Cat Pot Feet UK 3 1/2"
13 x Burgon and Ball Cultivating Rake 14"
13 x Burgon and Ball Daisy Grubber 11.5"
11 x Burgon and Ball Flat Fork 12"
11 x Burgon and Ball Classic Shears 12 3/4"
13 x Burgon and Ball Hand Trowel 12 1/4"
12 x Burgon and Ball Mid Length Fork 19"
11 x Burgon and Ball Hand Hoe 10"
12 x Burgon and Ball Mid Length Trowel 20"
12 x Burgon and Ball Mid Length Rake 22"
13 x Burgon and Ball Magnetic Mini Steel 4"
10 x Burgon and Ball Mini Herb Shears 8"
12 x Burgon and Ball Potato Harvester 18"
4 x ARS Curved Blade Fruit Pruners 6"
4 x Clay Block for Flower Arranging 3"x2 1/2"
8 x Sakurahamon Koeda Bonsai Shears 8"
8 x Sakurahamon Ashinaga Bonsai Shears 8"
4 x Dewit Five Tine Cultivator 11"
2 x Foggit Watering Wand 24"
5 x Wilcox 251 Trowel 12"
8 x Kiddo's Flower Press 5"x7"
2 x Kuwa Hoe 12"
3 x Khurpa Large 12"
3 x Khurpa Small 11"
2 x Lawn and Sod Sickle 5"
1 x Japanese Grass Sickle 13"
1 x Long Handled Kana Hoe 18"
5 x Hanakatsu Brand Hanako Square Frog Pin Cup 1 1/4"
5 x Hanakatsu Hanako Rectangular Frog Pin Cup 1 1/4"
5 x Saboten Uproot Weeder 6 3/4"
6 x Joyce Chen Original Scissors 6 1/4"
4 x Kiddo Chopsticks 7"
4 x Needlenose Chikamasa Shears 7 1/2"
Notify me of updates to English Dibble 9 1/2"